and where is your heart, if not in the sea? They descend a narrow cement staircase to the beach; some alone, some in pairs. It is a Sunday afternoon in January. A thick mist hangs low over Vesuvius Bay on Saltspring Island, off Canada’s west coast. The damp cold is insistent, penetrating. Nevertheless, these hardy individuals have come to swim. This will not be a quick act of bravado. They will be in the bone-chilling water for over an hour, as they are most Sundays, regardless of the weather. Diana Hayes, who started all-season swimming around Saltspring 13 years ago, is one of the first to appear. Nine other women and one man soon arrive wearing wetsuits and carrying bags stuffed with gear. They tug on booties, tuck their hair into hoods, help each other with hard-to-reach or recalcitrant zippers, wrestle on flippers and gloves. 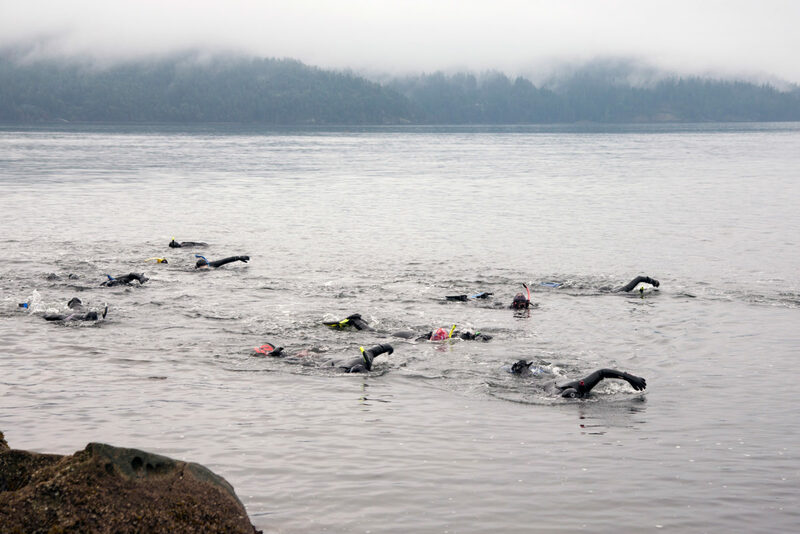 After a final transformation—the addition of masks and snorkels—the swimmers carefully negotiate a slippery ramp to the sea and ease themselves into the frigid water. Then they are away, the clumsy business of squeezing into skintight neoprene forgotten. Their black forms gleam and 11 pairs of arms and legs cut through the water, making a purposeful rushing sound. Most of the seals are over 55. They don’t look like super athletes; a couple are slim, but the majority have comfortably solid bodies. 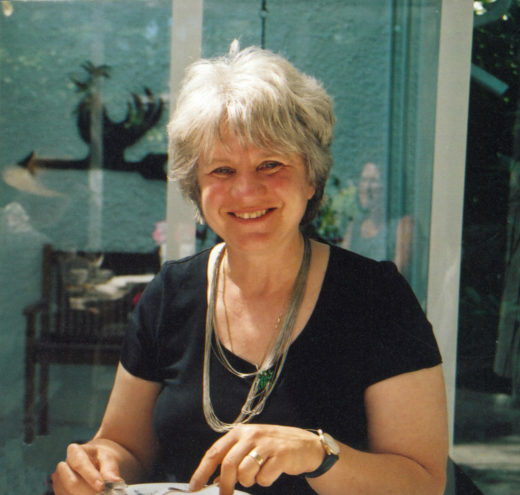 Elly Silverman, 75, is one of the oldest seals and a former head of women’s studies at the University of Calgary. “I’m not particularly fat,” she maintains, laughing, “but I’m not thin. Rather than casting aspersions on myself for not looking like a stick, I’m only too grateful.” A nice adipose layer helps withstand low temperatures. But why expose yourself to the chill? For Hayes, the draw is multifaceted: “It’s therapeutic for the mind, the body, and the spirit. You benefit from the healthy air, the salt water against your skin.” Whatever ails you, she says, it will be lifted by swimming—it’s better than coffee and pills. Exposure to cold water has been touted since Roman times when bathers followed immersions in hot and warm pools with a dip in a cold one in the frigidarium. The Finns have such a long tradition of swimming in ice water they have a name for it—avantouinti. In the United Kingdom, winter swimming has become surprisingly popular over the last decade. The Outdoor Swimming Society, which promotes the practice, has grown from 300 members in 2006 to 23,000 today. Noradrenaline may also play a role in supressing pain, as indicated in a few small studies. He advises acclimatizing slowly. In a 2005 study, Michael Tipton and Clare Eglin, both in the physiology department at the University of Portsmouth, found that a regimen of short, very brisk (10 °C) showers can reduce a person’s respiratory rate in cold water by 21 percent. Pat Parkes, 68, joined the pod early as well. Formerly the owner of a plant nursery, she suffered a massive stroke in 1997 after she fell in her greenhouse and hit the back of her head. Four years later, back problems still affected her. “I had a special brace made. They told me I would be wearing it the rest of my life.” But once the brace came off and with encouragement from her doctor, Parkes began to swim and practice yoga. Her back strengthened. “Pat Parkes is now the most spry, graceful, flexible seal amongst us,” says Hayes. The health and fitness benefits of ocean swimming are only part of the allure. As Dupuys, an accomplished painter, points out, “From the shore, you see this flat lovely opaque layer. Then you put your head under and it’s a different world. It’s right there, but you don’t see it. It’s almost like a secret world.” Anemones, crabs, shrimps, and the occasional dogfish reveal themselves. Sometimes the swimmers come upon schools of fish so dense with tiny fry that moving through them is like being in a silver cloud. Shafts of light illuminate kelp forests and the seasons come and go underwater just as they do on land. In the spring, nudibranch eggs mass on eelgrass, the eggs hatch, the nudibranchs grow and drift away. And in the late summer and fall, lion’s mane, the largest known species of jellyfish, appears, waving red and orange tentacles. 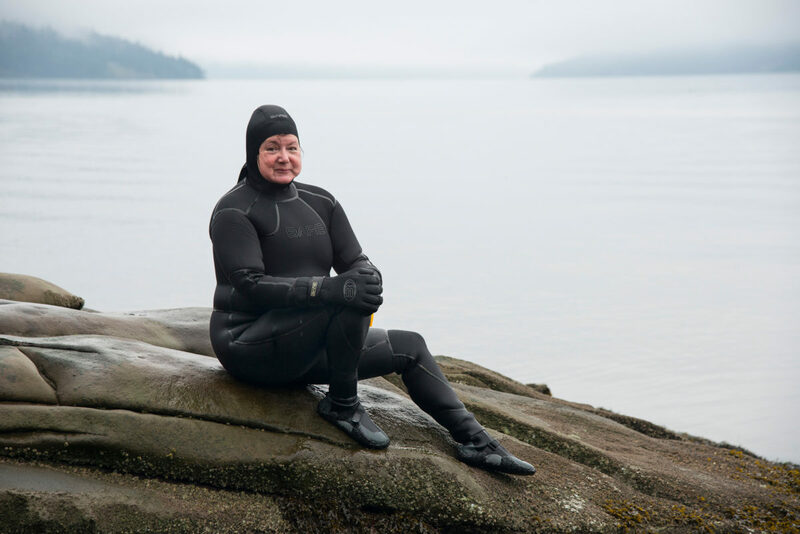 Diana Hayes explains the joys of swimming in the ocean, year round, off coastal British Columbia. tufts like ears, eyesight of a hawk. When the seals return from their Sunday circuit of Vesuvius Bay, they clamber up the ramp. Twisting and yanking, they strip off their rubber skins. Dupuys, recovering from a second hip replacement, struggles with this maneuver. Her husband, Jérôme Dupuys, has come to help. The other seals request his assistance, too, and since he is French, they merrily tease him about being their “French undresser.” Then Kelly Waters, 44, mentions feeling mildly hypothermic. Parkes produces a mohair blanket. Someone else brings tea. Another seal proffers cake. Cite this Article: Claudia Cornwall “Becoming Seals,” Hakai Magazine, Apr 22, 2015, accessed April 25th, 2019, https://www.hakaimagazine.com/features/becoming-seals/.